Wayne, Pa. (August 28, 2017) — Tekni-Plex, Inc.’s new state-of-the-art manufacturing facility in Suzhou, China, near Shanghai has begun production. The company will hold a grand opening celebration on September 19th. Earlier this year, Tekni-Plex announced a $15 million dollar investment in the facility to support the growing needs of the Asia-Pacific pharmaceutical and medical device market. 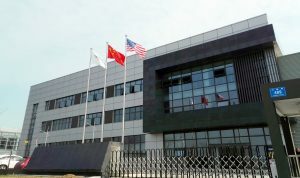 The more than 140,000-square-foot (13,000-square-meter) facility has already started manufacturing Tekni-Plex’s Natvar, Colorite and Action Technology products. The facility features three Class 100K cleanrooms to accommodate medical-grade tubing and components production plus one Class 10K cleanroom that will produce Natvar’s pharma-grade tubing. The facility is producing Natvar’s recently-announced silicone extrusion tubing for catheters, feeding tubes, drug delivery and peristaltic pump applications. Production for microextrusion tubing that targets a wide variety of demanding neurovascular interventional therapies and surgical applications is expected to be onstream early next year. The facility will also manufacture Colorite custom compounds for medical device applications, and Action Technology’s dip tubes used in a wide variety of food/beverage, pharmaceutical, personal care, industrial and household pump applications. Among those representing Tekni-Plex at the ribbon cutting will be Paul Young, chief executive officer, Russell Hubbard, vice president-international and general manager, Ian Kenny, global managing director, Colorite, and Bob Donohue, general manager of the company’s Natvar business unit. Local officials are also expected to attend. For further information about attending the event contact Coco Xu at Coco.Xu@tekni-plex.com.